Always wanted to come home to all your tv shows right at your fingertips? Never want to sit at your computer for hours getting everything configured? You're at home here! In this guide we will use 4 programs running on Ubuntu Server 14.04. I assume you are starting with a formatted computer. We will be installing Ubuntu Server followed by Kodi, SABnzbd, Sonarr, and CouchPotato. This script may not work on Ubuntu 16.04 and above. We recommend using AToMiC ToolKit, which has more features, is constantly updated, and well supported on GitHub. After we install Kodi we will install SABnzbd (Usenet Downloader), Sonarr (TV grabber), and CouchPotato (Movie Grabber). With these three apps all your favorite tv shows and movies will be automatically downloaded and organized so they appear just right in Kodi. Before proceeding please review our disclaimer. Lets get started! 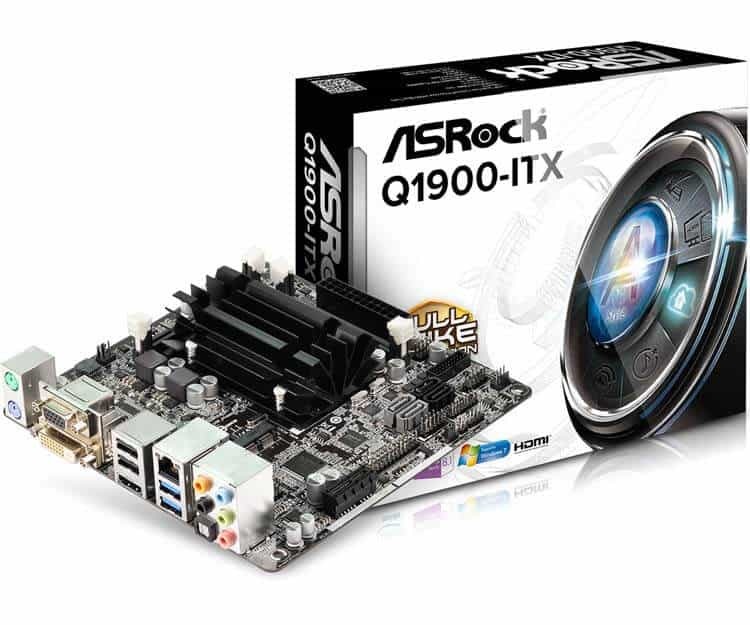 ASRock q1900-ITX. Hide it anywhere! The username has to be “kodi”. All lowercase. You can create another user after the install if you need it but for this guide all we need is the kodi user. You can set any password you want but one must be set. DO NOT encrypt your home directory. This requires a password at start and you wont have any way to enter it. When the installer asks you to select additional applications to install select OpenSSH. The best way to do the following would be through SSH. In Windows, install PuTTY. Once PuTTY is installed you will need the IP address of your Ubuntu machine. In Ubuntu type sudo ifconfig You should see at least two interfaces shown. The IP will look like 192.168.1.34. One will have the IP 127.0.0.1. Do not use that one. If there are more than one IP besides the 127.0.0.1 just try each of them until you are connected. 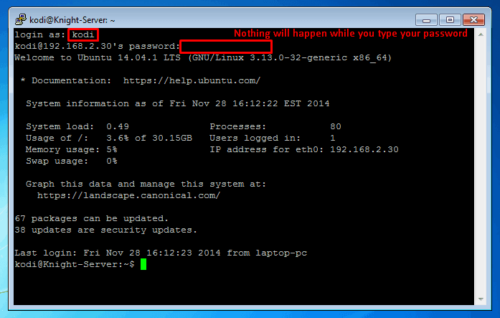 Enter the IP of your server. Once you are connected, login as kodi Then enter the commands below. You can copy and right click in putty to paste. The Kodi installer will ask you some questions and start working away. You can leave everything default unless you know what you are doing. Some points might take awhile. Please be patient. You can select none when it asks for a IR Transmitter. When that is done your computer should restart and you should be greeted with a beautiful yet empty Kodi media center. Dont worry, we will set that up with everything else. Thank Hack-kid from the kodi forms for this script. Some dependencies will install and then you will be asked a few questions. The username and password you want to log in with can be anything you want. It will be used for logging into Sonarr, CouchPotato, and SABnzbd. Then you will be asked to enter the directory to store your files. Your home directory is the best location but you can also set other mounts if necessary. The next 6 questions are about your Usenet Provider. Check with your provider for the details you need. You then will answer 3 questions about your Usenet Indexer. You can only enter a newsnab indexer here. Such as Oznzb or nzb.su. If you dont have one you can leave these blank and enter them later in Sonarr and Couchpotato. Select which apps you want to install. (all are selected by default) and press enter to start the installation. Of course, replace UBUNTUIP with the IP address of your Ubuntu system. If you do not know your IP address run ifconfig command on PuTTY and look for the IP address after inet addr. You may be warned that the connection is not secure or the certificate is unverified. You can ignore this error. The certificate if signed by your Ubuntu IPVR and will secure your connection. You can login with the Username and Password you entered in steps 2 and 3. That's it. Start entering shows in Sonarr and movies in CouchPotato. The Sonarr, Couchpotato, and SABnzbd installer was written by me, and while I have changed pretty much every line of the script I got my start with the AtoMiC CouchPotato, SickBeard, and Transmission installers from htpcBeginner. I am a major movie lover and system admin. I spend a lot of free time working on my movie theater. Keeping everything running. Over the last 4 years I have gotten my system so stable I never have to think about it.